Oscar Hernandez already had a long-established career and sterling reputation as a musician and arranger when he got a call from Aaron Levinson in 2000. The producer had an idea for a new project, and he was sure Hernandez was the right person to bring the idea to life. Though much of Hernandez’s work to that point was focused on helping other artists realize their own goal – he had worked with Paul Simon, Kirsty MacColl, Rubén Blades and many others – Levinson’s concept would place Hernandez front and center. 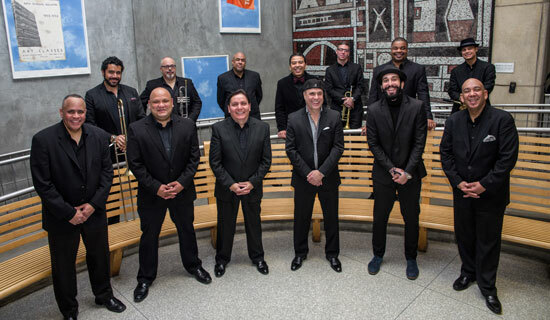 After a serious of conversations during which the concept was refined, the Spanish Harlem Orchestra was born. SHO would embody the music and culture of New York City’s storied Spanish Harlem, a neighborhood rich in history for Americans of Latino heritage. But “the idea was just to do a record,” Hernandez says today. “That’s it; nothing else.” Neither man had any particular goals or aspirations for the project beyond that. And in fact the effort almost never got off the ground. After Hernandez assembled a band, booked studio time and recorded what would eventually be released as Un Gran Dia en el Barrio, the Warner Brothers record label more or less dropped the project. Hernandez grew up only a few miles from Spanish Harlem. And the neighborhood was an important part of his youth. “It’s a place where we used to go for social events, to shop for food, and we had family there as well,” he says. “And later on I would play in clubs there.” He credits Levinson with picking the perfect name for the Latin jazz group, one that evokes the history and mystique of the neighborhood. Once the band took off, Hernandez found that there was much more interest than he had anticipated. “People were calling from Europe, Scandinavia,” he says. “’Tell us about Spanish Harlem; we see it depicted in pictures and movies.’ Because it represented a culture, a people,” Hernandez explains. And although Latin jazz is irresistible to dancers, he says that Spanish Harlem Orchestra is about much more than that. While he understands that the music makes people want to move, Hernandez prefers playing performing arts centers and festivals, “where people can sit down and listen to the chemistry, the arrangements, the musicianship.” He doesn’t want people to take all of that for granted. “Sometimes dancing trivializes the art aspect of the music,” he says.